The Lower Fox Demonstration Farms Network (“Fox Demo Farms”) is a Great Lakes Restoration Initiative (GLRI) project designed to showcase and demonstrate leading edge conservation practices that improve Great Lakes water quality by reducing phosphorus from entering Green Bay and Lake Michigan. The partnership is the first of its kind in the Great Lakes region and it consists of eight producers within the Fox River Basin, their crop consultants, Brown and Outagamie County Land and Water Conservation Departments, the Natural Resource Conservation Service (NRCS), and the University of Wisconsin-Extension. Register on or before January 8th for a chance to win a gift card! The Great Lakes region has diverse geology, climate, topography, and soil that provide challenges to controlling erosion and non-point source pollution. The diversity of the region creates challenges for managers to develop conservation practice systems that function in a predictable manner while addressing the region’s conservation priorities. The Fox Demo Farms was designed to work closely with producers to address these challenges at the ground level and provide solutions that can be implemented on a large scale throughout the river basin. The Fox Demo Farms’ mission is to demonstrate the effectiveness and adaptability of conservation practices to reduce erosion and sedimentation, control phosphorus runoff, and address other nonpoint source pollution issues. Additionally, Fox Demo Farms is measuring the feasibility of implementing conservation practices on farms in northeast Wisconsin. To create a culture that encourages collaborative efforts to restore soil health and reduce runoff pollution, improve water quality, and support a strong regional economy. Establish demonstration farms within the Lower Fox River Basin to test new and standard conservation systems in reducing phosphorus and sediment. Establish an efficient mechanism to share this technology and information with farmers, agribusiness, conservation agencies, and the public. Create opportunities for others to test their research and program ideas at the demonstration farms. 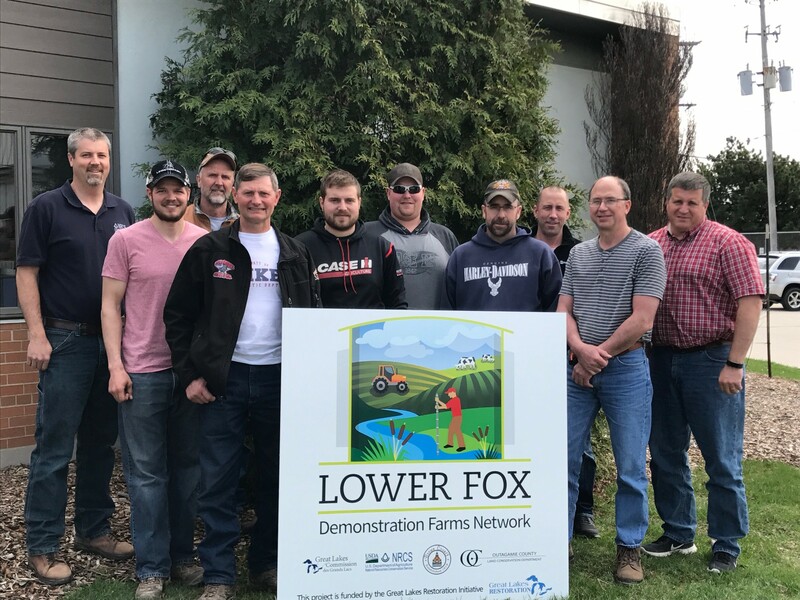 Share information and lessons learned from the Fox Demo Farms throughout the Great Lakes basin.